There’s nothing quite like the human voice. As our primary means of communication, nothing can engage us quite like it; nothing can enrapture or enrage us quite like it. The human voice is our most personal instrument. Its range and infinite versatility make it a singular instrument. Those of us who have the ability to earn a living simply by speaking are certainly fortunate. 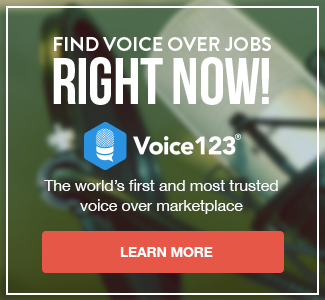 Can you really earn a living doing voice work, you ask? German classical composer Richard Strauss once noted that the human voice is the most beautiful instrument of all but the most difficult to play, while famed British poet Henry Wadsworth Longfellow regarded it as the organ of the soul. The voice is present at the core of our personal power and can project whatever we propose; it expresses the rhythm and the purpose of our existence. Beyond being gifted with a great voice, voice-acting is both an art and a craft one must develop and refine over time. Voice training and technical expertise are essential; the way you sound and the way you apply the tools you require to record your voice add so much to the impact of your message. All these things are critical components of your credibility and authority as a professional voice talent. Interestingly, research has shown that the sound of a speaker’s voice matters twice as much as the content. Successful businesses know this. As a result, when looking for a voice to project their brand message, they’ll most probably seek a voice that’s confident, responsive, and utterly believable. Ours is the digital age. The Internet of Things is surging ahead, bringing with it extraordinary opportunities. But to cut through the clutter and be heard in the cacophony of cyberspace, businesses need outstanding voices. Most brands want to radiate passion and presence. While technological innovation continues to progress in leaps and bounds, the human voice remains a constant — and a remarkably powerful weapon. The choice of the right voice is a no-brainer when it comes to compelling and impactful marketing and sales strategies. So a career awaits you. Make yourself heard!